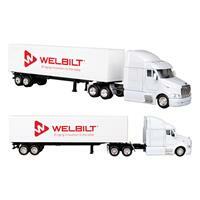 This 1:43 scale International Lonestar truck is available in white and features opening back doors. Made of die cast metal with plastics. Each truck is packaged in an individual retail box. 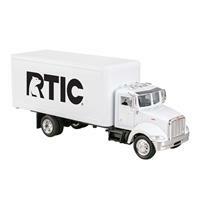 This 1:43 scale box truck is available in white and features opening back doors. Made of die cast metal with plastics. Each truck is packaged in an individual retail box. 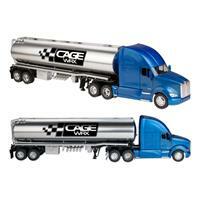 This 1:32 scale Kenworth T700 Tanker is made from diecast and plastic. Model features rolling wheels. Made of die cast metal with plastics. Each truck is packaged in an individual retail box. 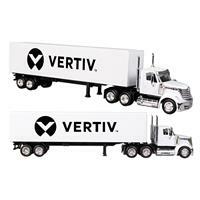 This 1:32 scale Kenworth tractor trailer is available in white and features opening front and back doors. Made of die cast metal with plastics. Each truck is packaged in an individual retail box. This Toy vehicle is Manufactured by Toy Wonders Inc and produced under license agreement. 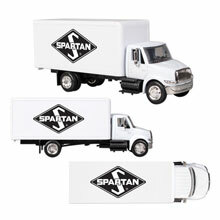 This 1/43 scale box truck is available in white and features opening back doors. Made of die cast metal with plastics. Each truck is packaged in an individual retail box. One color or two color logos. Two color logo is dependent on your artwork. 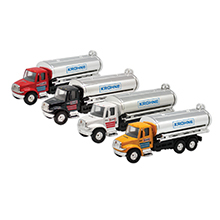 These oil tanker trucks are stunning replicas that collectors and children alike will adore. These eye-catching models feature a pull back function, come in an assortment of four colors including red, white, black and yellow and are made of metal and plastic. They are individually packaged in retail boxes and can be customized with an imprint of your company name and logo to increase brand visibility. Pricing includes a 4 color process clear decal on both sides of the oil tanker. No white ink. This Refrigerated Box Truck is a stunning replica that collectors and children alike will adore. This replica is white in color, features a pull back function and the doors on the back and side open. 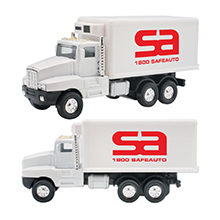 It is made of die-cast metal and plastic and can be customized with an imprint of your company name and logo to increase brand visibility. Imprint available on one side and top only. 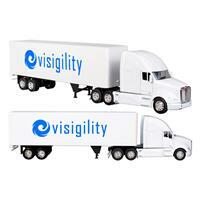 Decal : Decal pricing above includes a 4 color process decal on one sides of the truck. A cool collectible that any child or collector will adore, this beverage truck replica will make a lasting impression. It measures 5 1/4" x 2 5/8" x 2" and features an opening back door and a motorized pull back function. 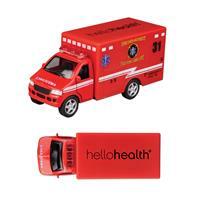 It is made of die-cast metal with plastics, and it can be customized with an imprint of your brand logo. Imprint on top of truck only. 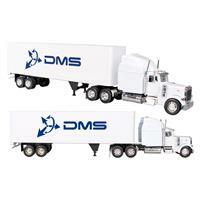 Direct Print : Direct print pricing above includes a one color, one top of truck. Decal : Decal pricing above includes a 4 color process decal on top of truck. The Kenworth T700 tractor trailer truck will take your next marketing campaign to fun new heights. This model is available in white and is made of die cast metal and plastic. It features a pull back function and both doors on the cab open as well as the back of the trailer. Packaged four to a retail box.